Very cute indeed. I enjoy TRC images a lot. Thanks for all the images. I can only watch them for now but it is enough. Aww... poor Sakura. She can't remember her past with her true love... *sigh* I love Tsubasa, but it has a very star-crossed-lovers feel to Syaoran and Sakura's romance. I'm kind of afraid how it'll end. 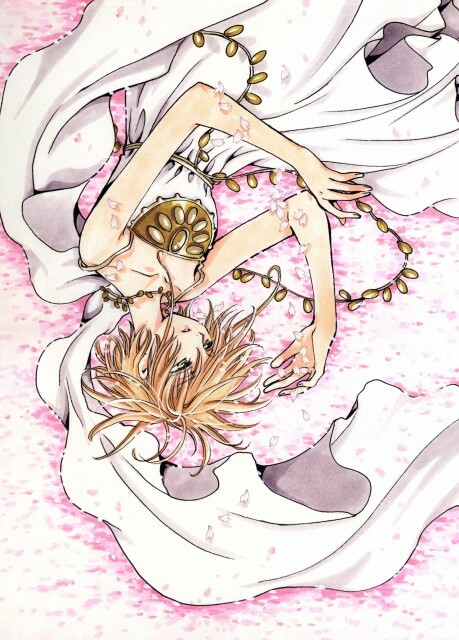 CLAMP don't always have happy endings to their stories. Anywho. Thanks for the lovely scan. thanks t for the scan! so love it! it just what i need to my layot! sakura is sooo sweet..love this scan! ^^ great now i can make a layout from it! Greaaaaaaaaat scan! Its really cute! Oh, wow. It's beautiful and so wonerfully detailed. This is so peaceful looking, really beautiful. It's such a lovely picture. Thanks for sharing! i love it; thanks for the scan! Nice, I like this picture. Thanks for posting it.